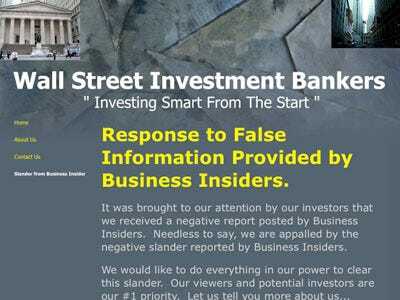 The company’s ad, seen running in the New York metropolitan market on Time Warner Cable during CNBC and FOX News programming, describes what sounds like a “straw man” mortgage fraud. First, there’s virtually no explanation of how the business works and how investors can expect to make up to $200,000 a month. The site implores customers to “Please request a PDF formatted brochure to be emailed to you by calling our 24 hour Customer Service,” but the answering service for the company had never heard of such a document. “They didn’t tell me nothing about this,” said a woman who picked up the phone at the number listed. (She promised to forward to request to “Bob”). Second, the number provided for “Thomas J. Loftsgard,” the “investor” in their company listed as a reference, goes to a woman’s personal cell phone in Iowa City, Iowa, who had never heard of Mr. Loftsgard. Fourth, Wall Street Investment Bankers claims it’s a “wholesale lender” and their “specialty is hard money lending and sub prime lending.” But the Mortgage Bankers Association told us it “does not have any information” on the company. But Larry Spiegel of the Miami firm did not respond to multiple requests for comment and the Florida Attorney General (the firm was incorporated in Miami after filing on January 21, 2010) said it could only check if there were complaints against the business (we did not immediately hear back, as with the New York Attorney General). Of course, it’s unlikely that there would be any complaints on a firm that is less than two months old. But Arney hung up when she was told the conversation would be on the record and recorded.